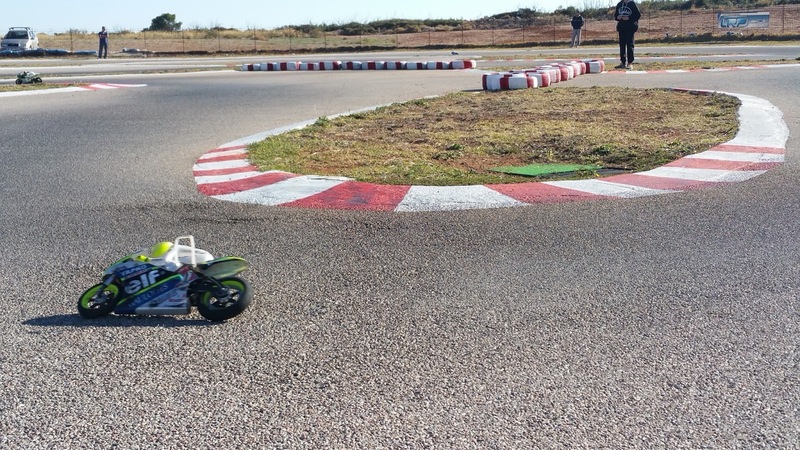 RC Bikes in Greece! : IBC Greece in English! Ενας ιστότοπος αφιερωμένος στις τηλεκατευθυνόμενες μοτοσικλέτες. Ολα τα νέα, κουτσομπολιά, αγώνες, φωτογραφίες, video, μαζεμένα σε ένα τόπο. Ολα τα σχόλια και οι προτάσεις αναμένονται με ενδιαφέρον!!! IBC Greece 2017 In English! I will tell everyone just this: You MISSED a great race! 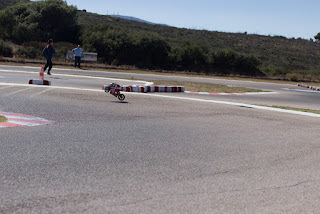 This was actually the second international rc bike race in Greece! Let me remind you, that earlier this year, Sures from Germany came and raced his JABBER with us! Preparation for the Greek Round of the IBC really started around the beginning of the year, when Clark suggested if we would like to do a round of the IBC series in Greece. Since Clark has already raced in our local track, FRT, back in 2006 or 2007, running a 1/5th scale LS car, he liked the track and thought of it! So, Clark talked with Fotis, the track owner and they made the date solid: IBC would be raced on October 15, 2017! So, to our racing things, then. Initially four drivers from Europe showed interest in our race: Pantovic from Serbia, two English drivers, Martin Woodcock and Lawrence William, and a French driver, Christian Gossè, with whom I have raced before at the Worlds! Clark, at first told me he was thinking of coming to Greece and make some vacation, along with the race, but a couple of weeks before the race, he told me he could not come, due to work. 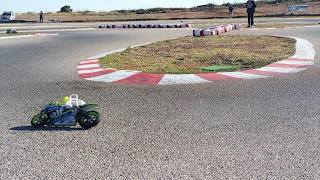 I felt it was –sort of- a little shame that we could not enjoy at least two of the fastest and best drivers in the world race at our track, because I think they could –and would, I am sure- show us how to be better drivers and how to prepare and setup the bikes better, among other things, no matter what kind of bikes we really race. 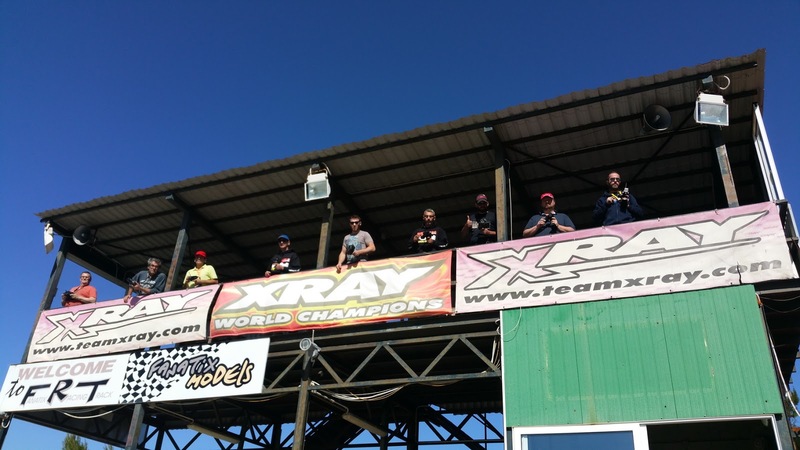 I did my part at the Worlds and the Warm Up and talked to almost every driver in person, asking, begging, luring them to come race with us! 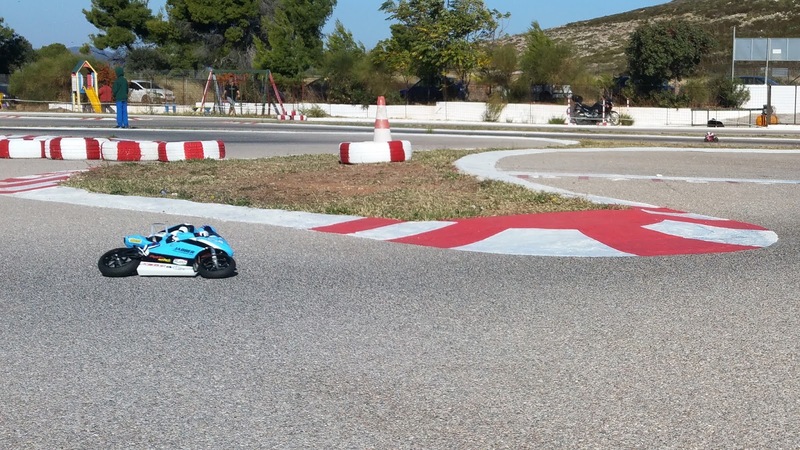 Anyway, with Theo, who travelled from Crete island to race with us, but also with at least three bikers I know in Athens, missing, we were nine drivers in total, to race the Greek round of the IBC. The track was available for practice not only the previous two weekends, but also, and especially for us, on Friday before the race and of course the whole weekend. In fact, on Friday it was exclusive for bikes, since no car drivers showed up! 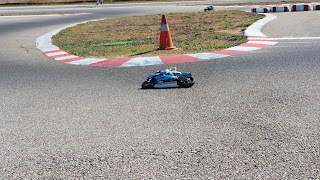 On Saturday, with everyone present we did a lot of practice runs and then when the darkness fell, we went to a local taverna, which is well known to the rc car drivers!!! 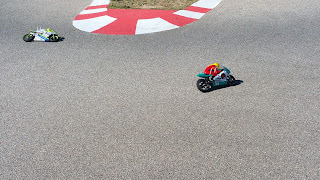 As for the weather, not only it was sunny, it was rather warm, too, at 22-25C every day, giving the track a nice traction! The race, on Sunday, started quite early: At 9 in the morning we did the first Q. heat. Vasilis started winning, keeping it fast and steady! He actually won two of the three Q’s, so he rightfully took the pole position! 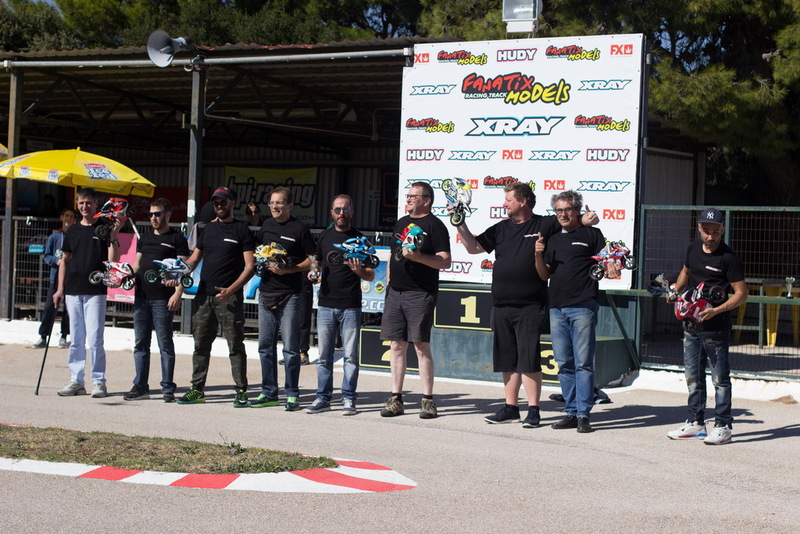 Petros, having won the second Q. heat, is in second position, while I managed to do a good run, only in the third Q. and grab the 3rd position. I was warming up while the day warmed too!!! 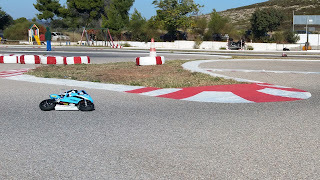 Typically, during the Q. runs I did the best lap: 32.024! Just so to have something to brag about!!! In the finals we had some good fun! 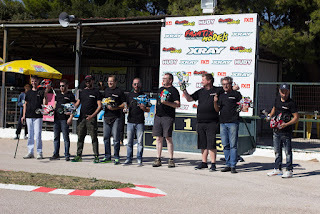 For example, before the drivers got up to the rostrum for the 1st A-Final, they all had a sip of local Raki, (made in Naxos island by my uncle!). And of course, as it was to be expected, we all did better lap times! 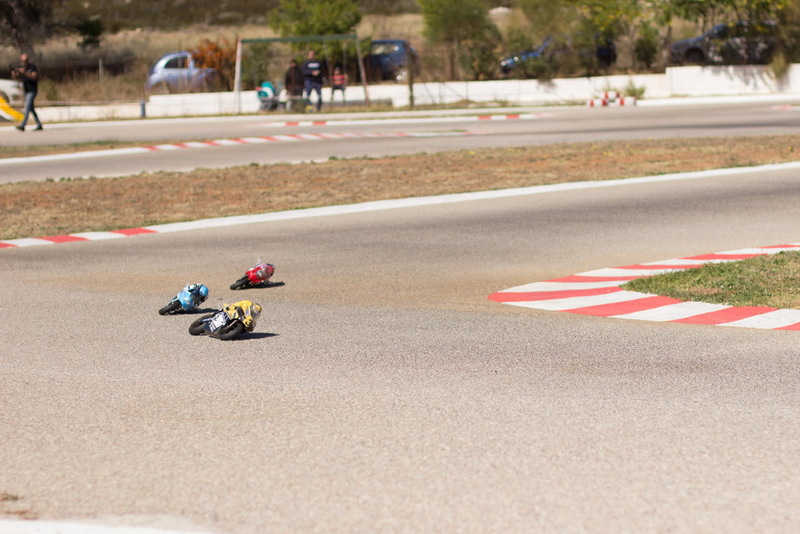 During the first A-final heat, Petros won after some hard fights with Vasilis. Difference was less than 10 seconds. This is where we took some photos of the drivers, after the 1st A-Final, and not before, so we wouldn’t lose the heat from the tires! 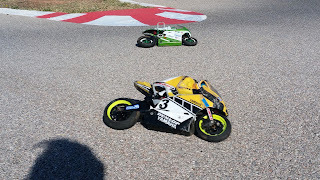 In the 2nd A-final, the final standing is the same: Petros and Vasilis, out front, and I am following, in 3rd position, again, just 3 seconds behind. Petros is officially the IBC Greece winner, with his RG BK1R, but he decided to race the 3rd heat, too. 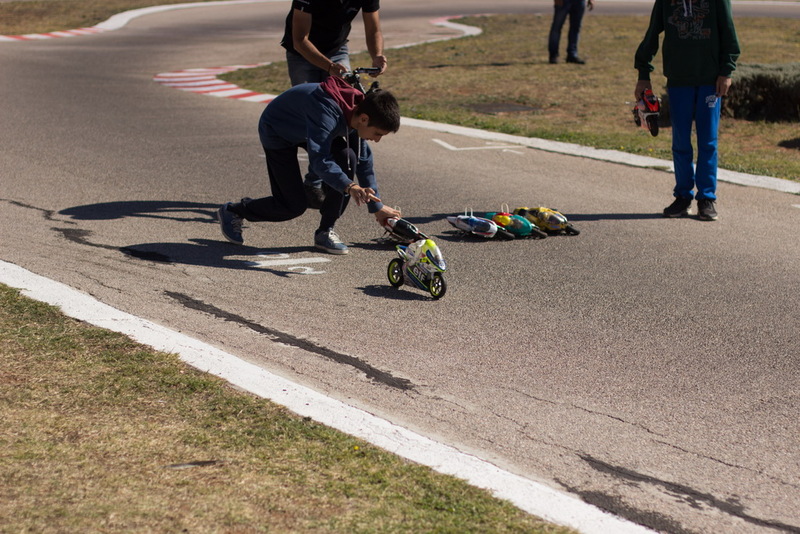 In this 3rd A-final heat, Vasilis, driving his amazing JABBER 2013, managed to lead most of the race, but being quite nervous, he lost it for less than a second, to Petros. I finished 3rd, again, but one whole lap behind these two guys!!! In the other positions, so that we mention everyone, Giorgio with his (noisy!) nitro bike, an RG Evo 5, gets better every tank he runs, even though, admittedly, he drives a bike that it’s possibly the hardest bike to drive. Anyway, he earned 4th place. Aris, in 6th position with his Nuova Faor T15 has some good excuses for his (lack of?) performance: His GSXR’s front Nissin brakes weren’t up for the job, he told me, and his friends said that they were worse than Yamaha’s. Go figure!!! 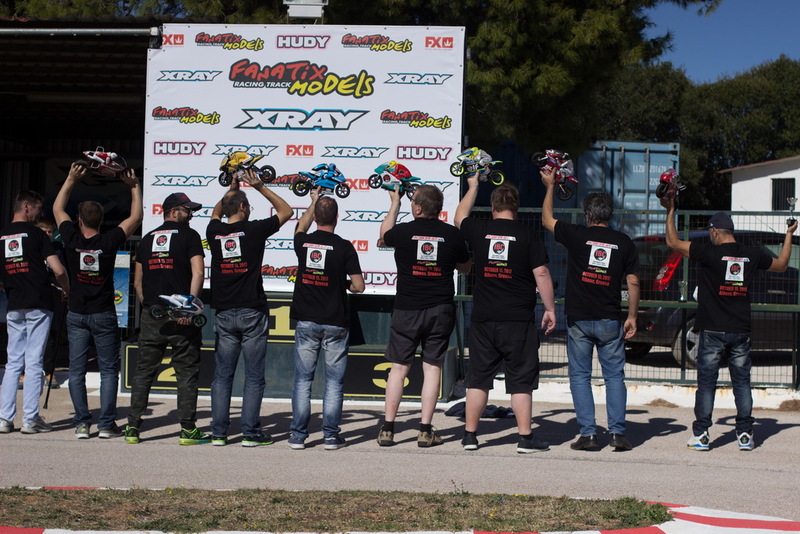 Panagiotis was certainly fast, but somehow was out of tune, so he managed the 7th position with his RG Evo5/BK1R hybrid. 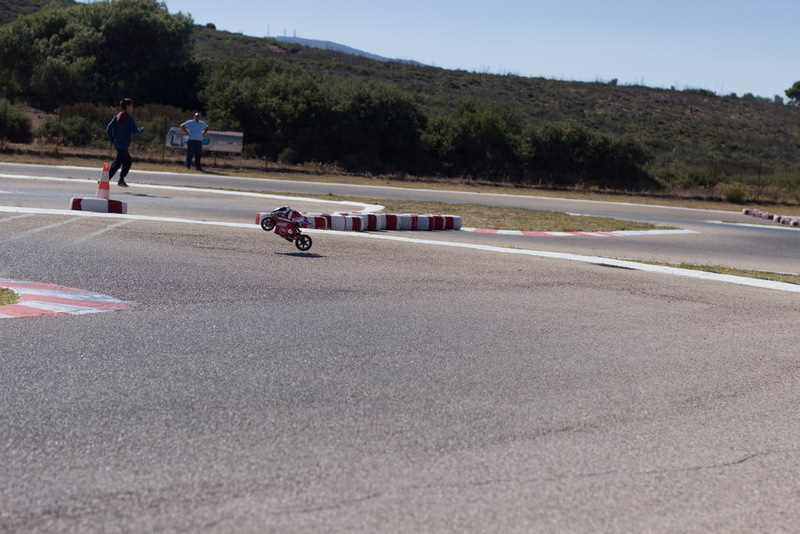 Theo, driving his trusty “old” TT SB5, despite tunring into parts twice during the finals, he managed to be always in contention and always competitive. While he is surely practicing a lot less than us in Athens, he showed that he can do it, and I personally think that the 8th position is not indicative. 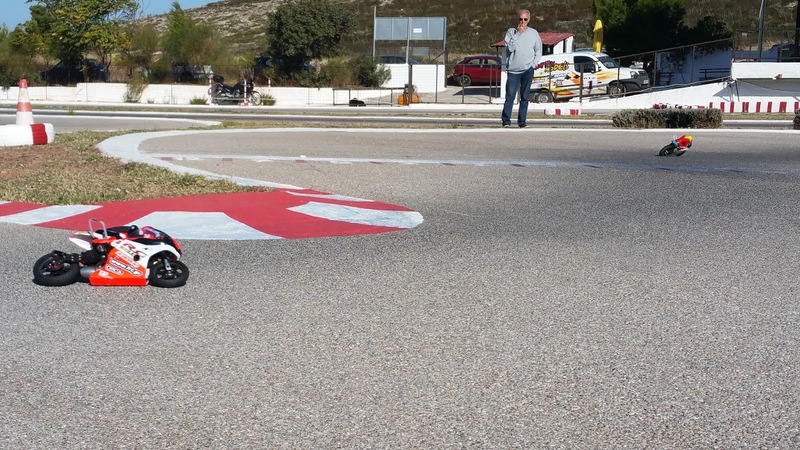 Martin with his JABBER 2015+ was really the slower driver on the track, probably due to his 13.5T motor, but he did a fantastic driving and was always walking around happy, smiling and certainly enjoying the Greek sun. When asked about his position, he just shrugged and smiled. A true Sportsman! We had an issue with the prizegiving ceremony, because the trophies that Clark sent us, didn’t make it in time for the race, so the track managed to get just three cups to give. 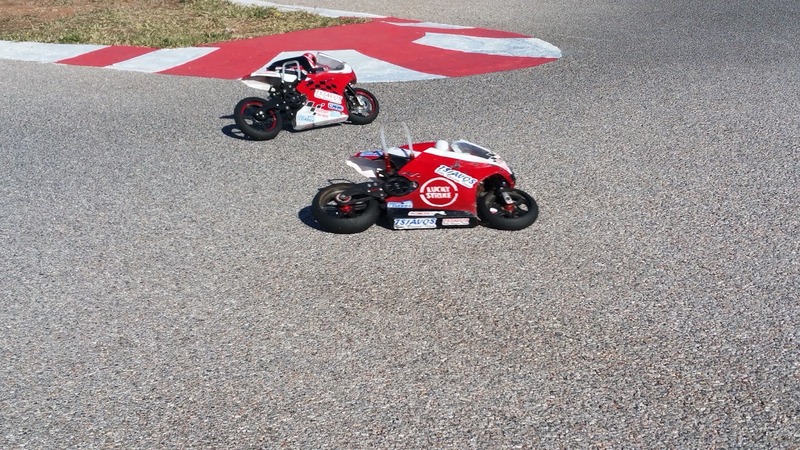 Our own Rcbikes.gr on the other hand, tried to fill this little adventure, giving a free t-shirt to all the drivers! I must thank here the XRS Stock Class Touring Car drivers who happily helped not only with the marshalling, but also providing close up insight to our driving, inspiring us (sometimes so loud!!!) and also taking photos and shooting videos!!! 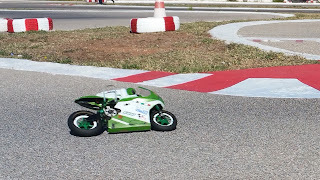 A special mention and thanks must also go to Giorgio’s three sons, who are always on the track and marshal for us, and they also do an excellent standing start of the bikes. So nice in fact, that there has never been a crash due to a bad start. 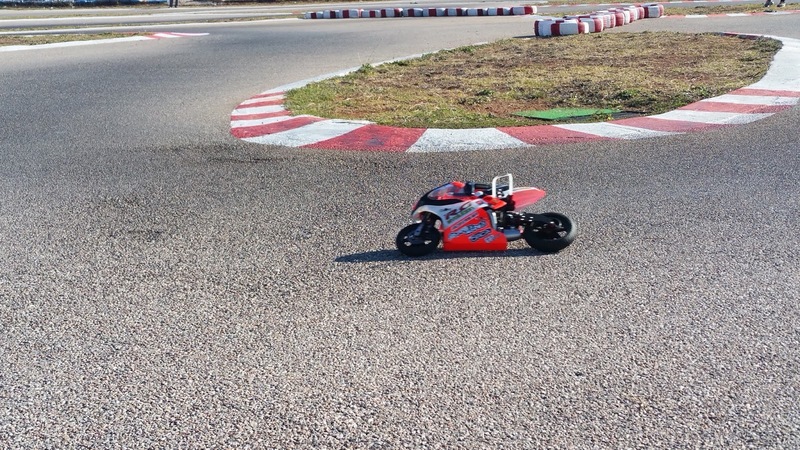 We had one boy start all the bikes in the main straight. Fotis, our race director for the day, managed to keep the drivers silent for the rest of the day! He has his ways with us!!!!!! Our friends from Drone Solutions Greece came and shot some nice video (maybe photos, too, not sure). Not actually “some” but rather complete finals and Q. heats! We will with a few days for them to edit and make the videos, and then we will post them in the usual social places, like Youtube, FB, etc. Aris, and me, among others, were talking after the races and realized we both crashed at some time, because we were trying to avoid the drone’s shadow on the ground! It was funny!!! We have seen their work on a previous 1/5 LS race, where we also ran our bikes. 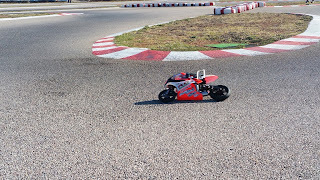 Drone Solutions made a 5 minute video, mostly with cars, and with a few shots of our bikes, so I believe that now that they were dedicated to rc bike racing only, we will soon see some great footage! In the pits, the atmosphere was always friendly, and our Fotis never said no, to some driver who needed 5 or ten minutes to repair something or prepare their bikes. Speaking about my bike and my race, I managed to break the carbon lower steering plate twice, but thanks to Giorgio’s dremel I managed to fix it, terrorizing my friends around me, a little, with the carbon powder (I’m still alive, by the way! You’re out of luck!). 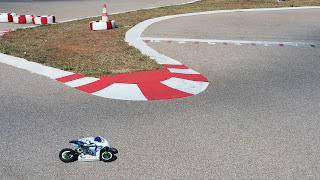 Anyway, I broke the damn plate again, and then I realized that the variable caster angle makes for better lap times: from 32.02 in the Q. heats, I went down to 31.8 in the finals, and managed to grab the 3rd position in the race, overall!!! On Saturday, my bike was a bit weird: while it would take left turns nicely, whether on the throttle, or braking, or just coasting, it would do all sorts of strange things in right turns. Sunday, first thing in the morning, I disassembled my bike’s steering system, and I found that the carbon top plate was cracked as well. Do you think it was due to me crashing? No way! I never crash… not on purpose, anyway! So, after changing that plate, the bike was transformed and started behaving! Then during the race, I saw the lower plate also broken… But I told you about that, right?! Just so we make some cafeteria talk, and bragging rights, (mine is bigger, etc!) 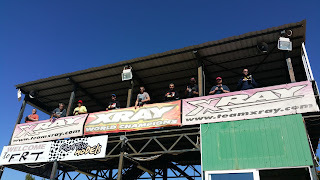 Petros did the absolute best lap of the day at 31.628, during the 2nd A-final. Maybe at the Worlds @ FRT!